Mandolin Orange is a Chapel Hill, NC-based duo led by songwriter Andrew Marlin and instrumentalist Emily Frantz, who ornament lyric- and harmony-focused tunes with acoustic and electric guitars, fiddle and mandolin. The duo’s understated instrumentation draws on bluegrass and rock-and-roll alike, keeping Marlin’s dark lyrical themes at the forefront of their folk-country sound. Together they deliver a sound that’s uniquely their own yet satisfyingly familiar, and were recently recognized by Rosanne Cash to be “very exciting young people making great music”. Since releasing their debut full length ‘Quiet Little Room’ in May 2010, the duo has shared bills with Chatham County Line, the Steep Canyon Rangers and Abigail Washburn, and has performed at notable festivals such as Shakori Hills Grassroots, Beaufort Music Festival, and Albino Skunk Festival (SC). 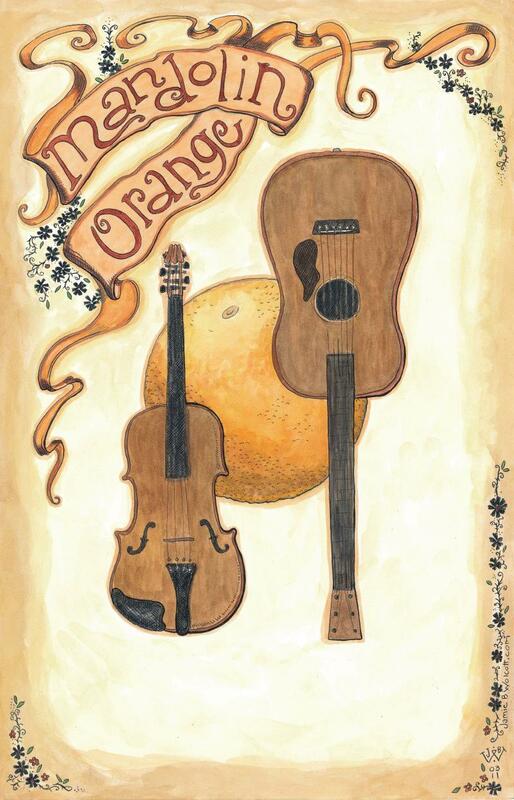 Mandolin Orange is currently touring throughout the southeast in advance of their second full-length release, and working on its finishing touches in the meantime. On some tour dates the duo is joined by their recently added rhythm section, made up of Jeff Crawford on bass (formerly of Roman Candle, SpencerAcuff) and James Wallace on drums and organ (formerly of Max Indian, The Old Ceremony). The majority of the forthcoming album was recorded in a cabin in Franklin, NC with Jeff and James in December 2010, while the rest was completed at Crawford’s Arbor Ridge Studios in Chapel Hill. The album is not yet named, and is set to release in early fall of 2011. The duo’s first album ‘Quiet Little Room’ released in May 2010 and was self-produced, recorded and engineered by Marlin and Frantz at Rubber Room Studios in Chapel Hill. The intimate and sparse style of the tracks met critical acclaim in several reviews. Independent Weekly’s Rick Cornell states that “all across the record is the sound of voices and instruments in the dark, finding light.” In a review for swampland.com, James Clementine confidently likens the album’s harmonies to those of Gram Parsons and Emmylou Harris. Muzzle of Bees noted that their “focus moves from the instrumentation to the melody and ethos of songs … a little bit grassy, a little bit country-folk, a little bit something else.” Both North Carolina natives, Marlin’s rural upbringing and Frantz’s roots in bluegrass fiddle and harmony serve as the basis for the duo’s more explorative style. Quiet Little Room reflects the influence of traditional music on their original material, which edges into southern gothic with poignant, sometimes foreboding lyrics centered on themes of the natural world. Mandolin Orange’s current work retains the intimacy, open space and focus established in their first album, but explores new musical territories through both Marlin’s songwriting and the addition of a full rhythm section. The band’s evolving sound reflects the eclectic musical environment of Chapel Hill, and their engaging performances are packing houses throughout North Carolina and beyond. With festivals booked for summer and Fall 2011 and an appetite for expansive touring, the second album release is sure to take this lyrical Americana act into new territory.